Paul Gonzalez provides an excellent look back at all the wonderfulness that has been Sly’s. 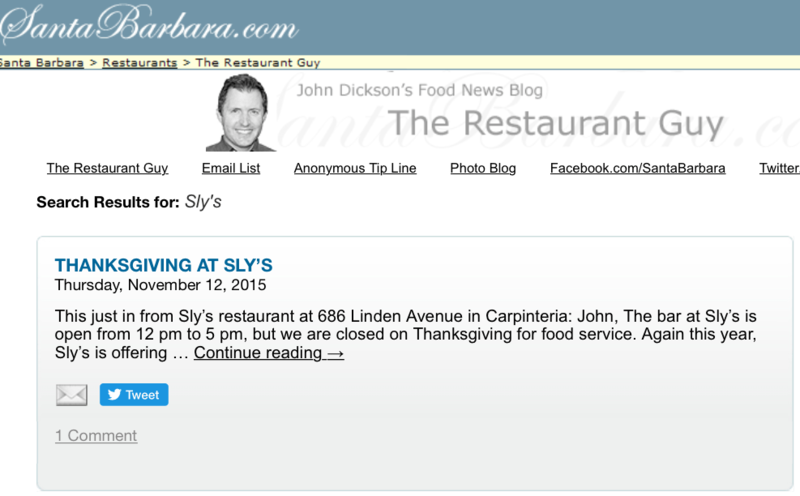 Ethan Stewart singled out Sly’s as the best restaurant in Carpinteria. 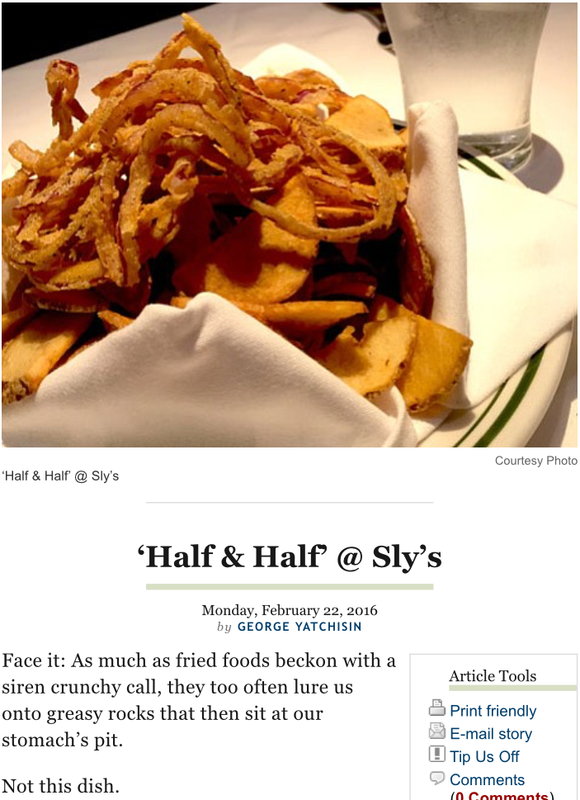 George Yatchisin raved about our skinny onion rings and home fries. Nikki Grey recounts a gathering of top area chefs, including Chef Sly, of course. 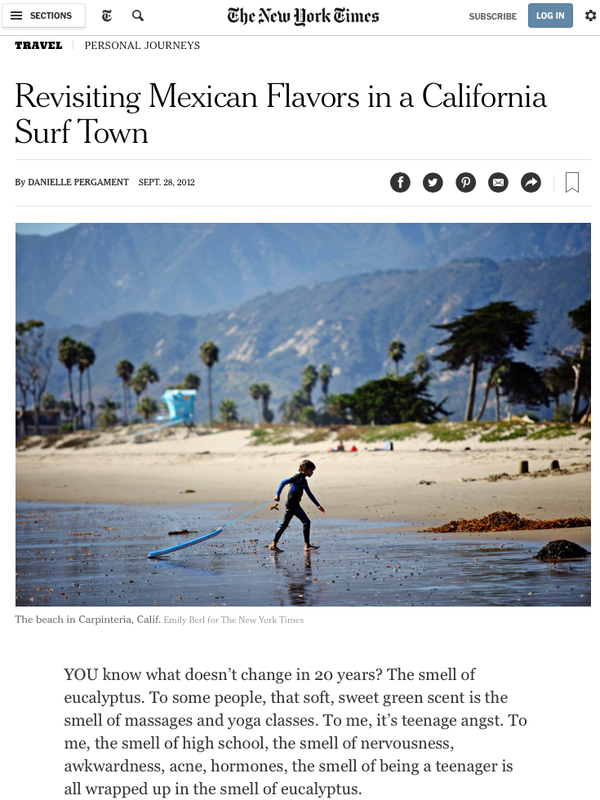 Danielle Pergament mentioned our grilled artichokes and “aromatic mussels” in The New York Times Travel section. 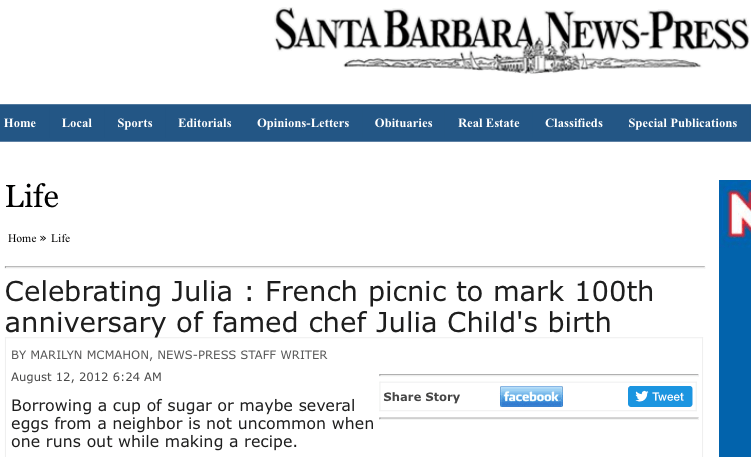 Marilyn McMahon tells a wonderful short story featuring Julia Child and Chef Sly. 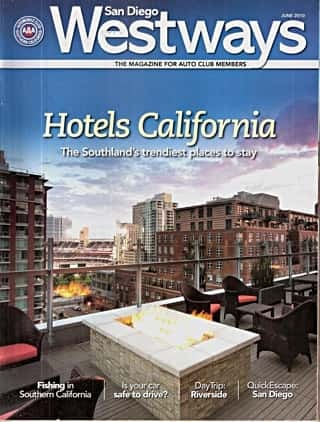 Our manager Mandy Chinn received “The Best Bartender in Santa Barbara” award in The Daily Pilot. Mandy also got some nice recognition in an article about cocktails. Starshine Roshell listed us among the hidden treasures on Linden Avenue. 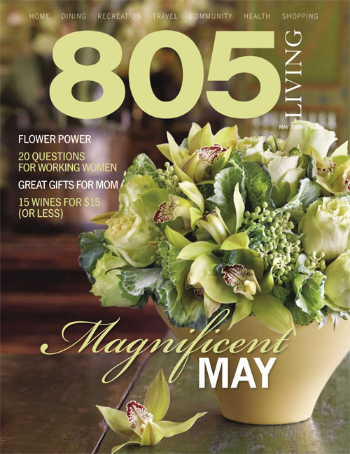 Angela Pettera wrote another great review of Sly’s in 805 Living. Another great review in the Independent by George Yatchisin. Thanks, George. 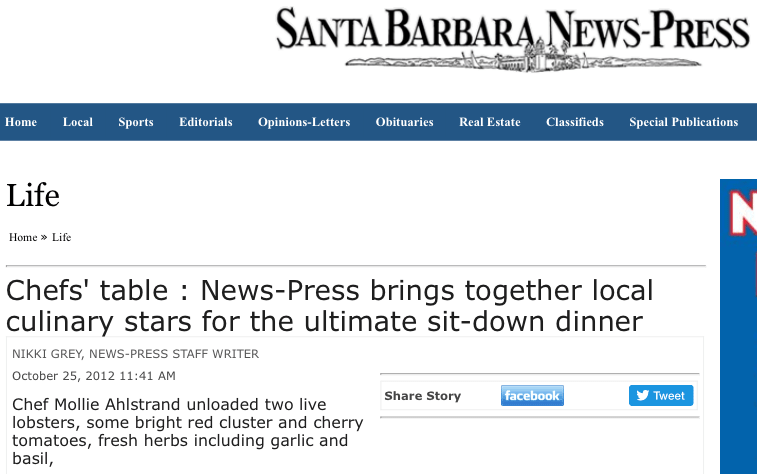 One big event that Sly’s takes part in is the Central Coast Wine Classic Hearst Castle Dinner. George Yatchisin’s first-hand experience is a treat to read. 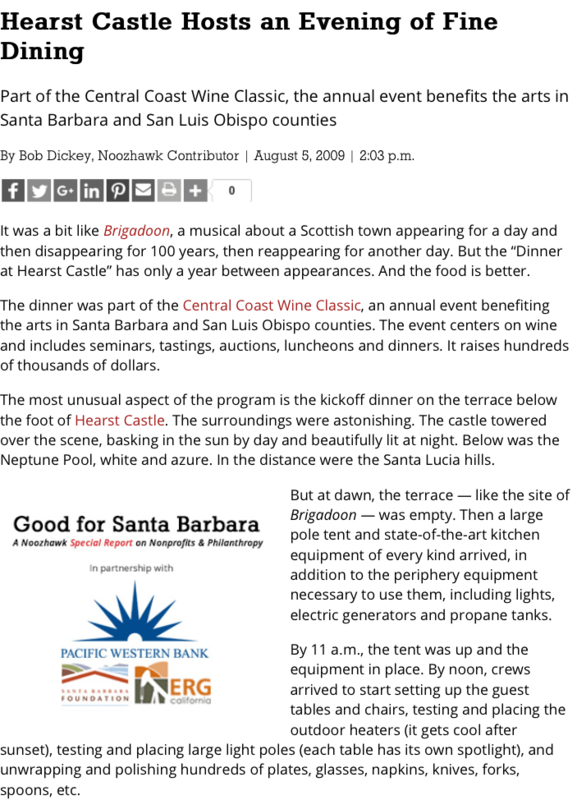 Bob Dickey at Noozhawk also covered the Central Coast Wine Classic Hearst Castle Dinner. We were noticed by the Chocolate Blog — and not just for our desserts. 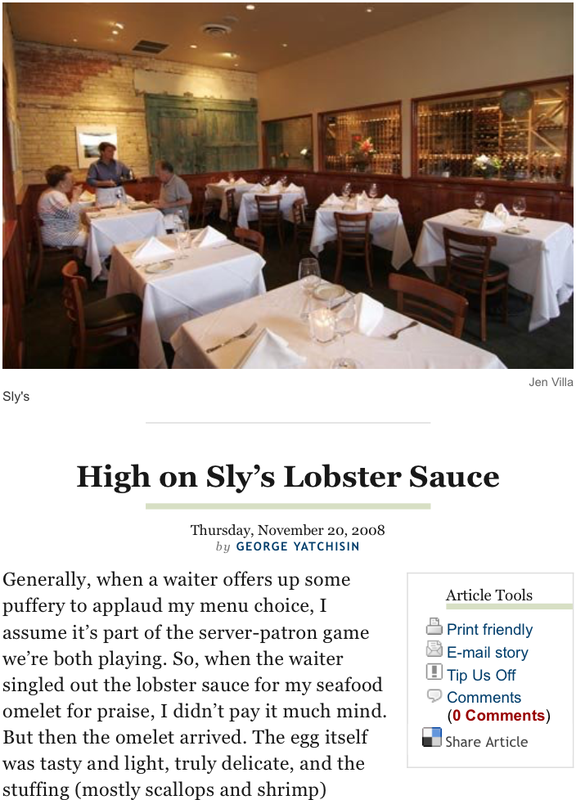 See what they had to say about Sly’s. 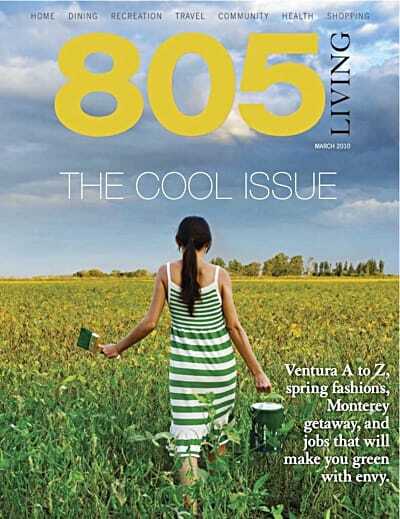 Angela Pettera wrote a great review of Sly’s in 805 Living. Another addition to the growing collection of reviews of Sly’s came from Rita Moran. It’s titled “Seafood Mecca”. 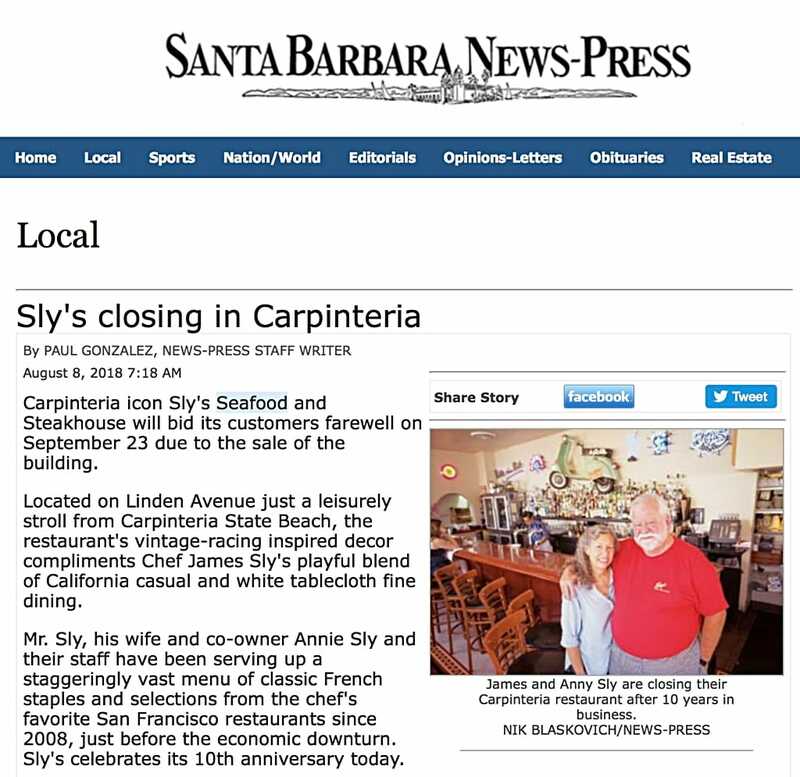 Nancy Ransohoff had some very nice things to say in Westways about Sly’s in Carpinteria. 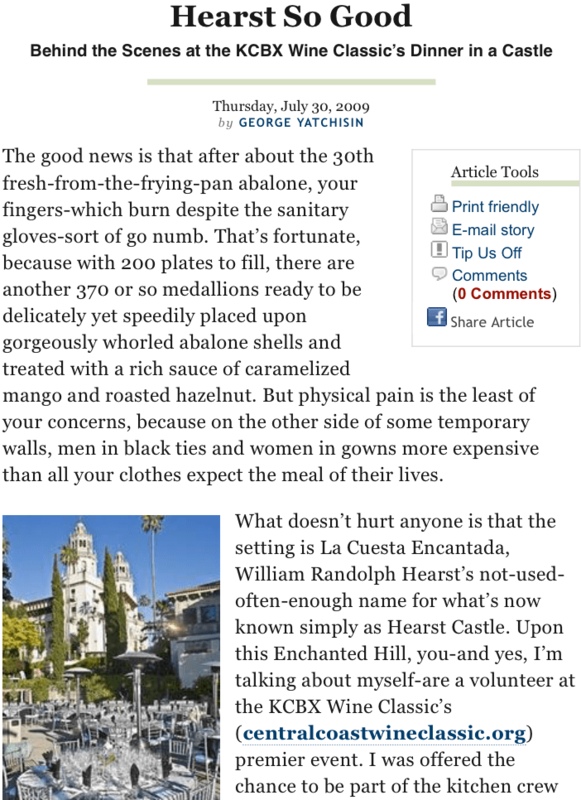 Reviewer George Yatchisin had some kind words about our brunch, especially our lobster sauce). 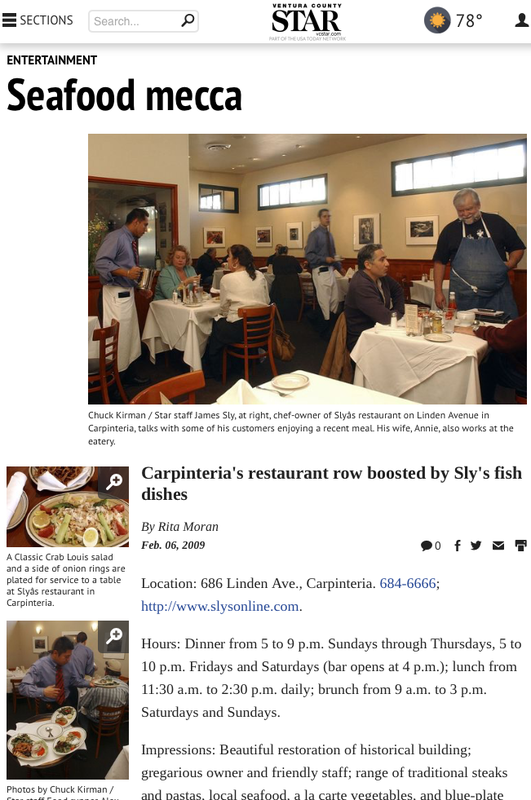 “Incredibly fine dining comes to Carp,” wrote food critic George Yatchisin in a blurb about our opening. 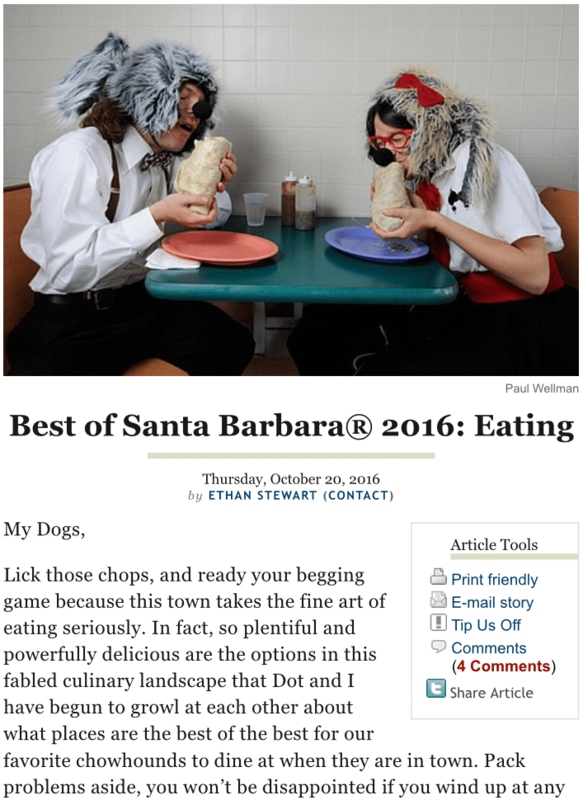 John Dickson’s posting in the blog section of our wonderful free Santa Barbara paper, The Daily Sound on Friday, March 6 called “Favorite Places” is part of a new series where John asks locals where they like to eat and drink. 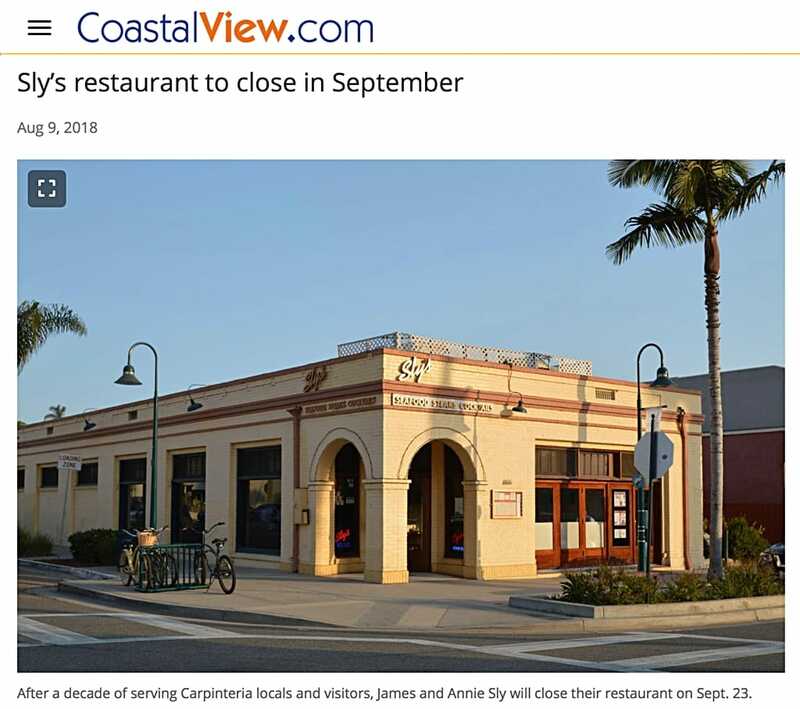 The same information appeared as a part of John Dickson’s Santa Barbara restaurant blog, “The Restaurant Guy.” It was nice that in interviewing 12 local columnists, more than one mentioned great restaurants like Los Arroyos, celebrating a 10 year anniversary soon. Great food and great people, Los Arroyos has put its stamp on the community in that time. 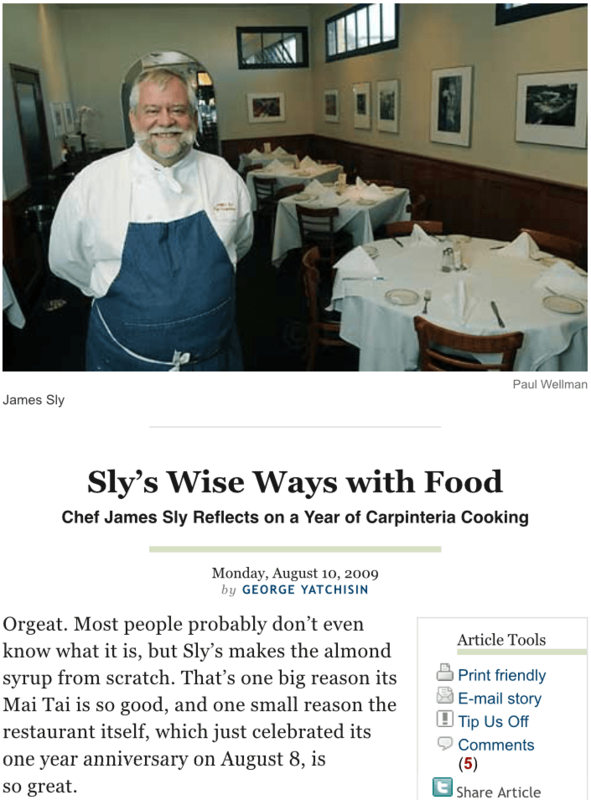 It was nice that another restaurant, a new comer, came up mentioned twice — Sly’s. 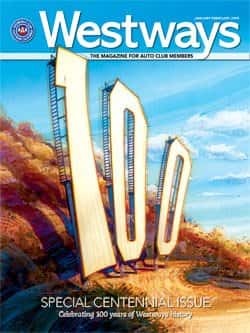 Others include Santa Barbara Magazine, The LA Times, Sunset Magazine, and the Santa Barbara Independent. 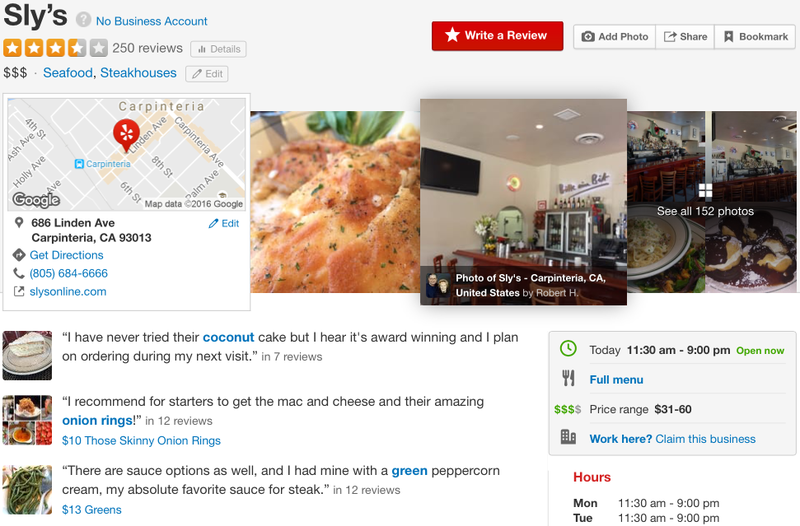 On the web, the community of Yelp.com is starting to contribute reviews about Sly’s. Sometimes reviews show up in the most unexpected places. Take this mention from our friends at RB Racing, for example. 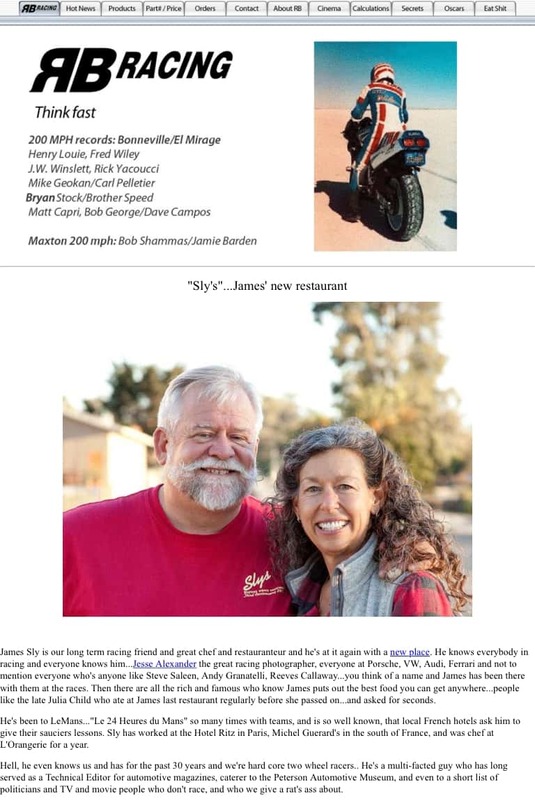 Scroll down past some cool motorcycle hardware to see the blurb about Sly’s.